The school year doth approach. For some of us, it's already here. For other of us, we still have another week or so to go and therefore time to procrastinate in getting our act together. You can guess at which camp I fall into it. I've been browsing through Explore the Wild West! and coming up with our lesson "plan" (I'm going to hold all plans loosely) for how we shall go about using it. This book covers seven different main topics, offering some information as well as a craft idea for each one. They are? Taking a look at the first chapter - Where Was the Wild West? - you'll find "Words to Know" (i.e., vocabulary words), craft ideas, basic maps, and notes of comparison between what things were like then as opposed to now. We learn about how America grew (Louisiana Purchase and Lewis & Clark, etc. ), and paragraphs highlighting key individuals who were instrumental in blazing western trails. This particular book is designed for use with ages 6-9 (translation: grades 1-3) and is perfect for our use right now. "Explore the Wild West! will answer many of your questions. It will introduce you to some amazing people along the way, like James Beckwourth, William Frederick Cody, and Sitting Bull. There will be lots of silly jokes, and fun facts, too. 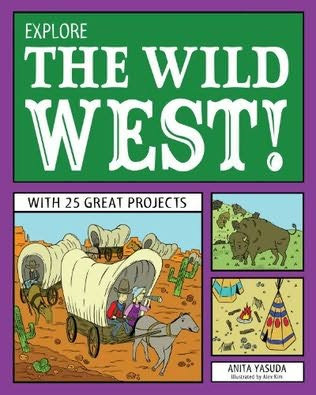 Don't be surprised if by the end of this book you start singing saddle songs, cooking trail food, and making your own covered wagon. What are you waiting for partner? Put on your boots and lower your hat. Let's explore the Wild West!" As with just about any book which provides or aids one's personal choice for a curriculum, there are things I like and things which I do not quite agree with in this book. (It's a bit more politically correct in spots.) However, given the fact that this book is designed for use with small children, my differences with it are so subtle that I have no hesitations in gleaning all the good which this book has to offer! I plan to have some fun with it this school year. Better news? Nomad Press has offered up one copy of Explore the Wild West! to one of my readers here at Reading to Know! Would you like to win? Simply leave a comment below. This contest will be open through Tuesday, August 28th and is open to U.S. Residents only. THIS CONTEST IS NOW CLOSED. THE WINNER, as selected by Random.org, IS #1 - Allison! Congrats! Thanks, Nomad Press for sending a copy of this book my way in exchange for my honest opinion and for also offering a copy to one of my readers. This sounds like a cute book! I would love to win this. Looks like something we could us this year. We are studying American History this year in our homeschool. I'll apologize in advance for going off on a total rabbit trail, but your comment triggered a totally random bit of information I learned on our hike this weekend. All of the mountain lakes in the Sierra Nevada have had fish since the white man first discovered them. The nature of the terrain makes it unlikely that the fish swam there. It appears that the Native Americans planted brook trout (and golden trout, for that matter) in these lakes. And thus, for my Sunday night dinner, I tip my hat to those who paved the way centuries ago. Please enter me in contest. I would love to win. I've used several Nomad Press books for our school. They are outstanding! I'd love to add this one to our collection!! This looks like such a fun unit to study. I love the variety of topics covered.